Baked Empanada Kaliskis ~ I Can Do That! Empanada kaliskis (fish scales) has been in my 'to make list' for as long as I can remember but even after getting a recipe with the procedure on how to make the layered dough (thanks again to Maricel) I was still hesitant because of the work involved and the dreaded deep-frying. 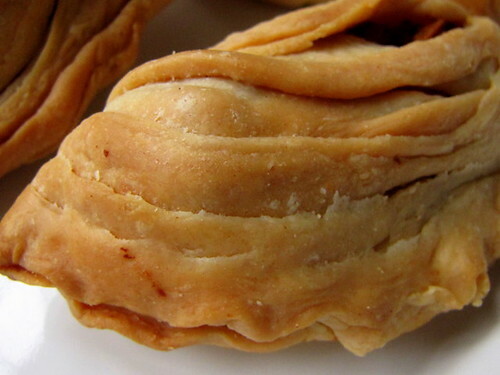 A reader renewed my interest when he suggested making the Italian sweet pastry sfogliatelle into a savory one just like empanada. 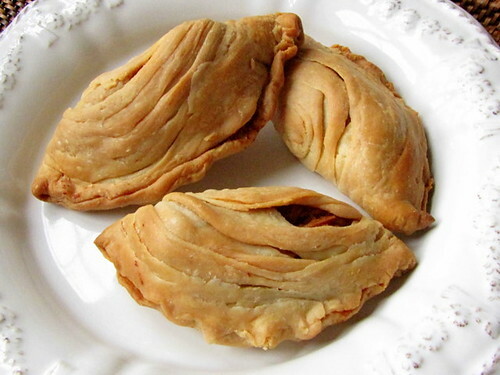 After reading both recipes and the one from Malta, pastizzi, which are all remarkably similar, I tested a small batch. Although I wasn't 100% successful in rolling the dough paper-thin and the empanadas don't have the thin layers of these ones, I still think it is worthwhile because they came out flaky, tender, and delicious. The following is Maricel's complete procedure for mixing and shaping the empanadas. The thickness of the slices is not specified; 1-inch thick is okay. I didn't soak the slices in oil, I brushed the dough with melted lard, sfogliatelle style, before rolling into a log. I baked the empanads in a 400°F oven for 40 minutes, brushing them with melted lard every 10 minutes to open up the layers. Cut in lard to flour until cornmeal in texture. Dissolve salt, sugar and egg yolks in water. Add to flour. Knead until smooth, adding up to ½ cup of flour if dough is sticky. Let rest 10 minutes. Using a rolling pin or pasta maker, roll until dough is paper thin. Roll jellyroll fashion around a piece of fresh coconut tingting until desired diameter is reached (bigger diameter for bigger empanadas). Be sure to roll tightly. Pull out tingting. Cut into crosswise slices. Soak in oil for 30 minutes. Roll out each slice on a piece of banana leaf using a center-out, center-out motion until circle widens. Invert onto another piece of banana leaf. Roll dough trimmings thinly. Put trimmings on top of inverted rolled, oiled dough. Add filling. Fold in half. Seal edges by twisting and turning. Deep fry in hot oil. Flush with oil to make scales open. OMG that is great. I love the recipe. That layered dough looks hard. hi o! i've had these before but didn' know they were called kaliskis. i love the flaky dough and the layers - only a few places here make it that way. 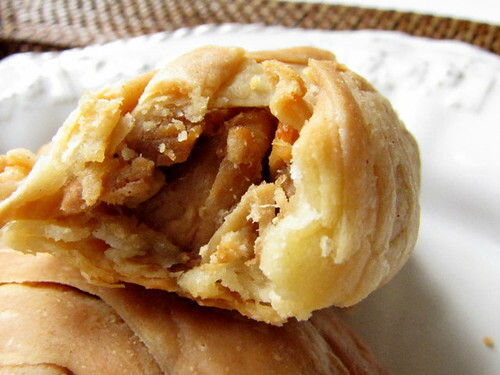 very nice photos of your empanadas! i wish i could eat one right now! Sidney, not yet expert, I have to make it really thin although I'm very happy with the result. Ann Marie, I agree, it's not a simple project. Great job with the dough! It looks deliciously flaky and is just pretty! Arthur, I'm planning to make that version later. I made this one first just to compare. The Bastilla sounds intriguing. I looked for it in my Moroccan cookbook, unfortunately it doesn't have one. Web it is for the recipe. Thanks for the wonderful ideas. Midge, thanks. They also keep well. They were still flaky after 2 days. No grease and not at all soggy.